HONG KONG, Dec 22, 2015 - (ACN Newswire) - China Wood Optimization (Holding) Limited ("China Wood Optimization" or the "Group", stock code: 8099), an advanced new technology group engaged in the processing, manufacturing and selling of processed wood products and which constantly strives to achieve energy conservation and emission reduction through low-carbon environmental protection measures, was the only Chinese innovative wood enterprise invited to the 21st United Nations Climate Change Conference and an exhibition held in Paris, France from 30 November to 11 December 2015. The opening ceremony of the Conference was attended by the leaders of 146 nations from around the world, including Chinese President Xi Jinping, U.S. President Barack Obama, and British Prime Minister David Cameron. China Wood Optimization's eye-catching exhibition was located in the "Climate Era" exhibition hall, next to The United Nations Educational, Scientific and Cultural Organization (UNESCO) display. Adhering to its principles on environmental protection and high-value application of wood and related products, the Group demonstrated to the world China's efforts and achievements in technological innovation, environmental protection and climate change management. Mr. Jean-Pierre Raffarin, former Prime Minister of France, Vice President of the French Senate and President of the Prospective and Innovation Foundation, met with Ms. Yim Tsun, Chairlady of China Wood Optimization, and Mr. Li Li, Chief Executive Officer of the Group for three times, at the National Assembly, Raffarin Foundation and China Day events respectively. He also presented a calligraphic work to the Group, wishing success to China's environmental protection work. During the National Assembly luncheon, Mr. Raffarin and Ms. Yim exchanged ideas and discussed the Group's contributions to environmental protection. Ms. Yim Tsun said, "We are proud to be representing Chinese environmental companies at the 21st United Nations Climate Change Conference. As a Chinese enterprise, not only should we be vigilant and confident of building a greener planet, but we also have to take concrete steps to achieve this objective. China Wood Optimization will continue to facilitate the industry's advancement through innovation; creating new ways to protect natural forests and contributing to the protection of the earth and its climate." 7 December 2015 marked the 21st United Nations Climate Change Conference's China Day, and a forum themed "Green Economy: Concerted Efforts of China and France" was held. The attendees included representatives from China International Trading Exchange Center of China's Ministry of Commerce; the Consulate General of the PRC in France; EU-China Economic and Cultural Exchange Association; UNESCO; and the Paris Branch of Bank of China. Companies from both countries engaged in extensive discussions on various topics, including ways to improve the climate and protect the environment. Mr. Li also delivered a speech on how innovative technologies can reduce the consumption of natural resources by human beings and increase forest areas. 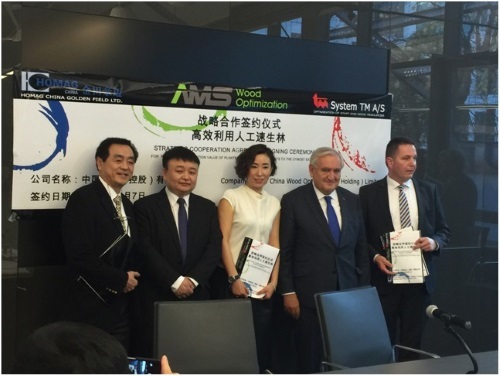 During the Conference, China Wood Optimization signed strategic cooperative agreements with System TM A/S ("System TM A/S") and HOMAG China Golden Field Limited ("HOMAG China Golden Field"), witnessed by Mr. Raffarin. The agreements were related to "Industry 4.0" and production lines, as well as technologies on high-value utilization and development of plantations. System TM A/S is a top-tier provider of comprehensive automated wood processing production line solutions in Europe, while HOMAG China Golden Field is the distributor in China for HOMAG Group, a world-leading wood equipment manufacturer from Germany. The aforementioned strategic agreement will allow China Wood Optimization to achieve full automation and a high level of efficiency in its production processes, in turn improving the quality of the Group's products to meet international standards. It also presents a new means of protecting invaluable natural forest resources by enhancing the scale of fast-growing plantations and increasing their utilization value, as well as sharing of resources.